For today’s intraday charts menu, I’m serving up a couple of short-term chart patterns, with a rectangle on EUR/AUD and an ascending channel on EUR/CHF. Whoa! That means I’m serving up a euro + chart patterns double special today. EUR/AUD has been trading sideways while respecting resistance at 1.5870 and support at 1.5710, which gives us a 160-pip trading range or rectangle pattern to play with. And if you’re lookin’ to trade the range, then heads up because the pair is making its way up after bouncing off the rectangle’s support area. Do note, however, that stochastic is already signaling overbought conditions and all that. Also, them moving averages are currently in downtrend mode. There’s therefore a higher-than-average chance for a downside rectangle breakout. And if that happens, then bears will likely be gunning for the next area of interest at 1.5620. But just in case support at 1.5710 holds, then bulls will likely be shooting for the rectangle’s resistance at 1.5870. And if bullish momentum is strong enough, then them bulls may even attempt a topside rectangle break, with 1.5950 being the next likely target. 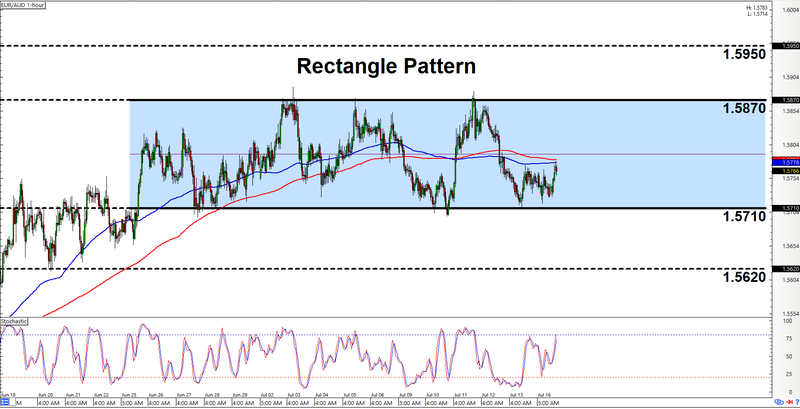 EUR/CHF has been trending higher for some time now after staging a topside breakout from that symmetrical triangle pattern that we found way back on July 4. Moreover, the pair is apparently moving higher while trapped inside that there ascending channel. 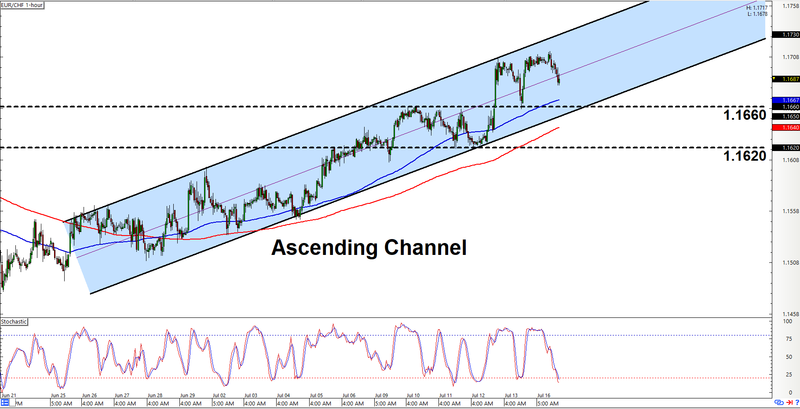 Anyhow, the pair is currently making its way down towards the channel’s support at 1.1660. Y’all may therefore wanna get ready to start lookin’ for opportunities to go long on the pair And all the more so, given that stochastic is already signaling oversold conditions and all that. But as always, just keep in mind that there’s always a risk that the pair may continue to move lower and stage a downside breakout. And if such a scenario plays out, then y’all may wanna think about bailing yo longs if the pair validates the breakout by moving lower past 1.1620.